Apollo is one of its kinds because it has buckets full of features. It has an elegant look which would attract your eyes like a bee to a honey. 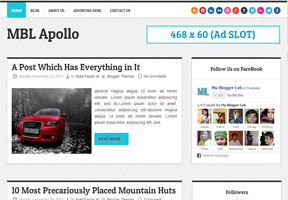 Since, it is a WordPress adapted Theme it is equipped with some wonderful features. This Template is Ideal for Niche sites i.e. Technology, Media, News Bulletin, Entertainment and etc. However, a person can also use on a Personal blog theme.